Sometimes you meet people, and things just click. We knew we were going to love Sam and Drew when we shot their engagement session, and Matt and Drew shared a special moment when they realized they both used to vacation in the same tiny northern Pennsylvania town. 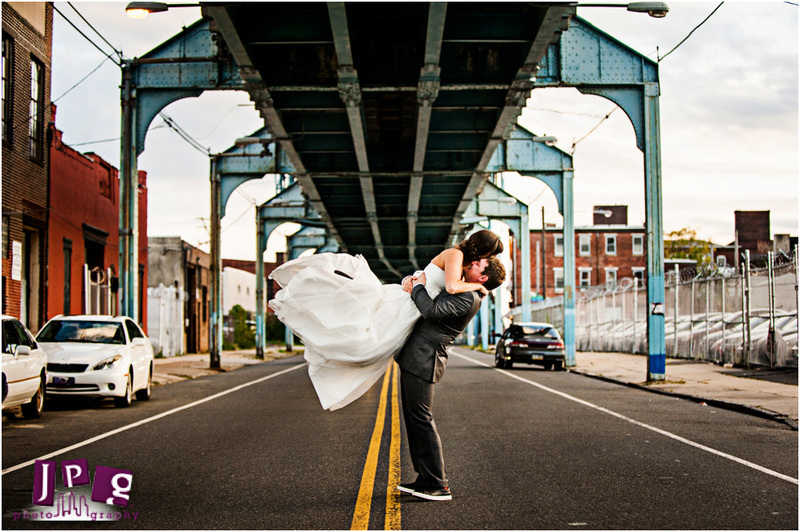 This couple’s wedding day was full of spontaneous special moments like this one, and we at JPG loved being able to capture them. 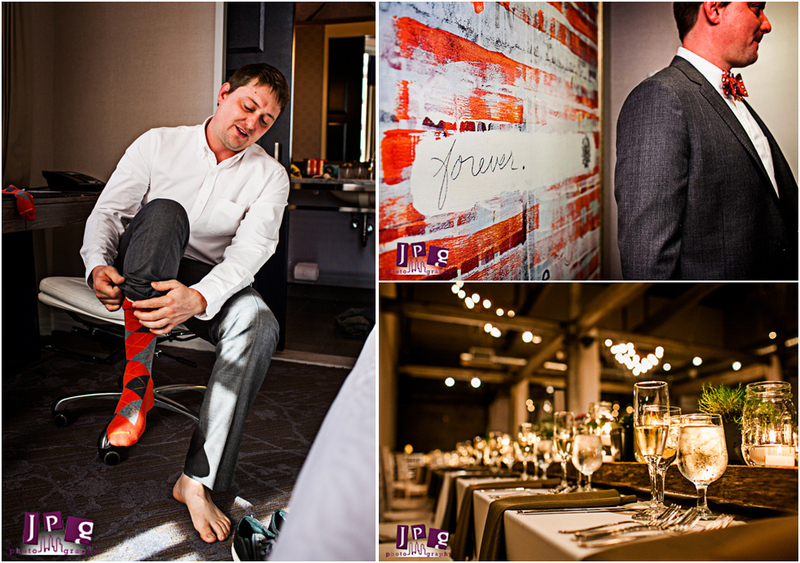 The couple got dressed and ready at the Palomar Hotel, and we witnessed a few crazy and funny moments with the smallest wedding guests. Drew’s godchildren got their hands on a flask and were pretending to drink out of it, and Sam had to hike up her dress to chase another little one down the hallway. 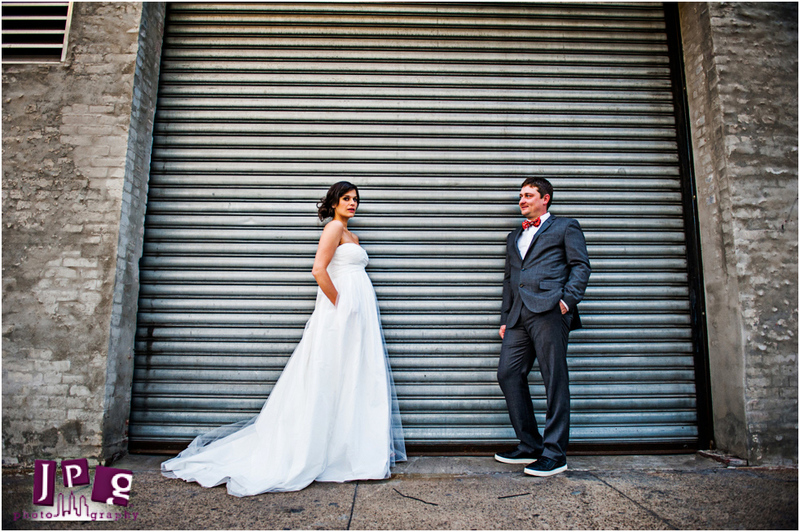 When all settled down and they were almost ready to go, Sam surprised Drew with a first look in the lobby before they hopped into a cab to head over to their venue. For their ceremony and reception, Sam and Drew chose Front & Palmer, an old industrial barrel factory with holes in the floor. Women wearing heels had to put special covers over their shoes so they wouldn’t get stuck! This didn’t phase Sam and Drew in the least–they laughed and took everything in stride. Drew, a talented artist, created the hanging glass decorations that hung over the couple during the ceremony. This was a perfect detail for their traditional Quaker wedding. Just like Jill and Bill, Sam and Drew had a Quaker ceremony with no officiant. The couple sat facing their friends and family and made promises to each other out of the silence. Sam and Drew’s ceremony was beautiful, a true reflection of the love we saw between them. After the two lit a candle together to symbolize their unity, their guests started the party off right with a shower of confetti over the couple! To follow their sweet and peaceful ceremony, Sam and Drew planned a lively reception full of surprises and celebration. We love weddings that are fun for everyone, including the kids. Sam and Drew had plenty of games at their reception, including old favorites like Skee-ball and Deer Hunter. It was hysterical watching the kids play Deer Hunter for the first time–they were so cute. Of course, it was almost as much fun watching some of the adults play, too. 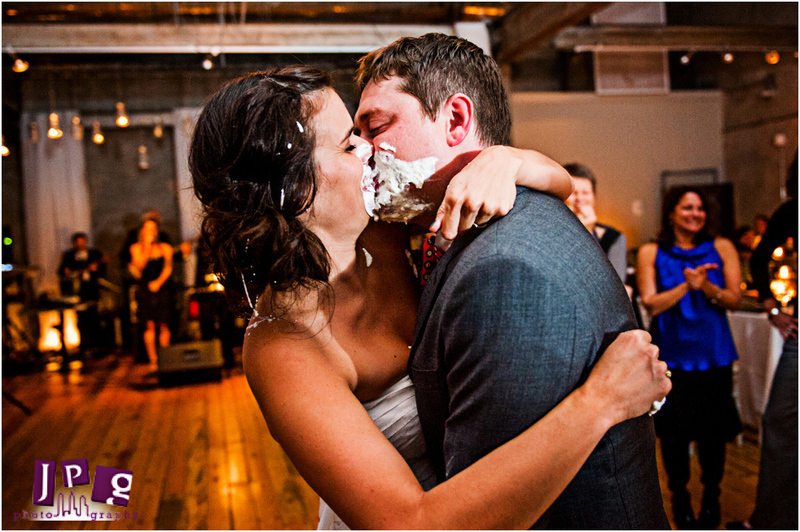 There was no shortage of laughter at this wedding, and Sam and Drew joined in when they smashed pies into each others’ faces for a kiss while their friends and family clapped and cheered. Thanks Sam and Drew for choosing JPG to capture this special day for you, and we wish you all the best in this crazy and wonderful journey called life.